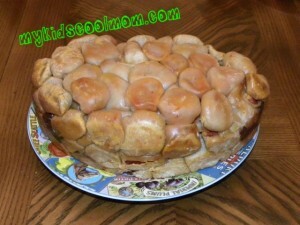 I was trying to think of something to make for a family reunion and after seeing a bunch of ideas thrown around on the internet, I decided to combine them all and make these homemade pull apart pizza rolls in the crock pot. They were fairly easy to make, just time consuming. I had no idea that it would take me 2 hours to prepare it. So, make sure you have enough time to prepare and don’t plan to do this right before you feed your kids lunch. Mine ate half the cheese and pepperoni behind my back. Of course, we made over 120 of these little rolls but you certainly do not need that many for a regular family meal. We ended up eating about 1/3 of it for dinner. The recipe below will make about 120 rolls which is a good number for a potluck or in my case, a family reunion. First, prepare the dough. Combine the water, yeast and sugar. Stir well and allow it to rest. Then add oil, salt and 3 cups of flour. Continue to add the rest of the flour gradually. Add more if it is too sticky. Sprinkle more flour on the counter top and knead the dough for 5 minutes. Let it rest. Knead again for 5 minutes and place in an oiled bowl. Next, prepare the pepperoni and cheese. 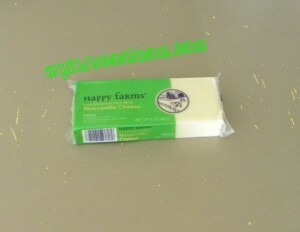 Cut the cheese into small blocks and then spray the inside of the crock pot. 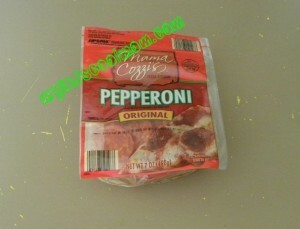 Set the pepperoni, cheese, sauce, crock pot and dough on the working surface and get ready for an assembly line. 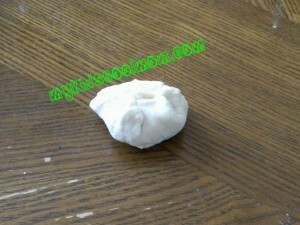 Pull off a small walnut sized piece of dough and roll it out on the work surface. 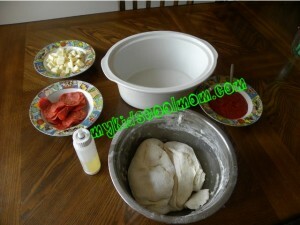 Make sure you roll it out big enough so that there is enough dough to pull up over the pepperoni and cheese. 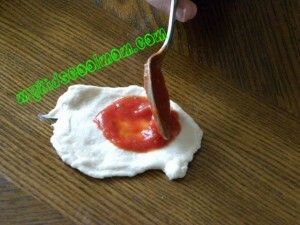 Once rolled out, place some marinara sauce in the middle. 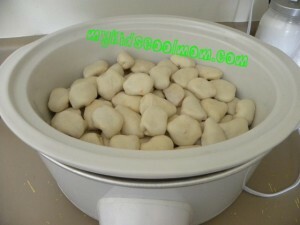 Be careful not to put too much on it or it will seep out and the dough will be difficult to seal. I had my 6 year old do this step. Next place a piece of pepperoni in the middle. This step was my 4 year old’s job. 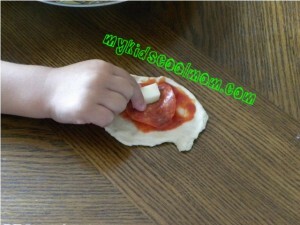 Next, place a piece of mozzarella cheese in the middle of the pepperoni. 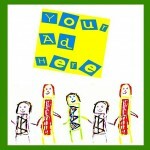 This was my 2 year old’s job. The next step was my job as it was too difficult for the kids to do. 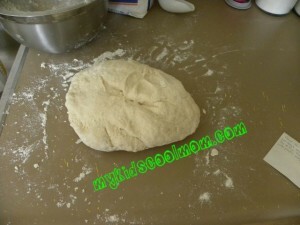 Pull up the edges of the dough and seal them. This will create your pizza roll. We put the crock pot on high for 4 1/2 hours because we didn’t get this finished until after lunch. It turned out fine for us but the next time we make it, I will be cooking it on low for 7-8 hours. 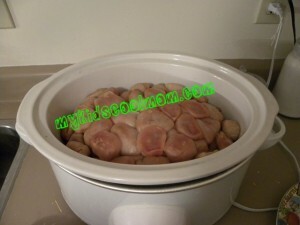 At the dinner table, I removed the rolls from the crock pot so we could pick it apart easily. I have to say that not EVERY roll stayed whole after picking it apart but about 3/4 of them did. I truthfully didn’t care that some of them slightly fell apart but I wanted to make you aware that all 120 rolls will not come out perfect. We sure liked this and we will definitely make it again. We served it with the remaining marinara sauce but it was still good without it. Please re-pin this recipe on Pinterest. so excited to try this 🙂 Sounds so yummy and I LOVE my crockpot! I hope you like it as much as my daughter did. She had it for lunch and dinner the next day and then lunch the day after that. She’s nuts about it.